Respect is something taught early in life, along with sharing and taking turns. These behaviors may come easy to some individuals, while others seem to need a little more encouragement in order to get along and play by the rules. With multiple roadway users, including motor vehicles, bikes, motorcycles, and pedestrians everyone needs to share the road, take turns, and ultimately show respect to one another on the road. Respect is a two-way street- when you give respect, you get respect; and nowhere is that truer than on Utah’s roads. through St. George in 2012. The Utah Department of Public Safety and Utah Department of Transportation have partnered together to promote Road Respect. “Road Respect Cars and Bikes Rules to Live By” is a grassroots campaign that aims to educate drivers and cyclists about the rules of the road and also encourage mutual respect so that everyone gets home safely. 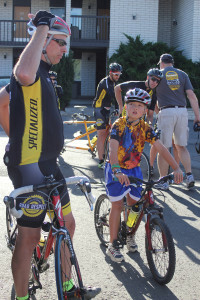 For the third year, Road Respect cyclists are touring the state and seeking to be a positive influence on people who ride and drive. Cyclists on the tour serve as a moving billboard” that demonstrate how to follow the rules of the road. There are two tours for 2013 beginning at the end of May. The Southern Utah Tour will take place May 29- June 1 and will visit Cedar City, Kanab, Springdale, St. George, and Parowan. The Wasatch Front tour runs June 13-15 visiting Provo, Salt Lake City, and Ogden. 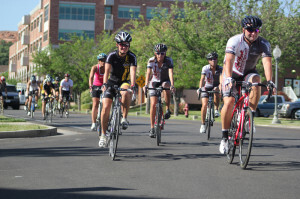 Cycling enthusiasts of all ages and riding levels are encouraged to participate in the community rides and festivities that include kids rides, bicycle rodeos, 25 & 50 mile ride options and mini-car shows. UTA is also offering free Frontrunner passes during the Wasatch Front tour for riders who wish to participate in the rides. For more information about the tour and community events, visit www.roadrespect.utah.gov .